Travelling on a budget can be a bit stressful. Especially if it’s your first time visiting Jerusalem. And yes, Jerusalem can be expensive. But it can also be really affordable. You just have to know your way around the city. So we took care of that. You’re about to discover the greatest secrets of Jerusalem – secrets that will make it so much easier on you and your wallet and let you enjoy your vacation without stressing about money. Here are 10 ways you can save money when travelling on a budget to Jerusalem. Jerusalem is a very touristy place all year round. After all it is the center of three of the world’s most practiced religions. However, January and February are relatively comfortable in terms of tourism. This means that you will be able to get cheaper rates on your accommodations. Now, you may be thinking: “Yeah, but it’s winter.” The thing is that winter here is not so bad, especially if you’re coming from Europe or North America. All you need is a good coat or jacket and you’re all set. Another good way to save some money on accommodations is by staying at hostels. Some hostels offer beds in dorms for as low as $20 a night! If you’re travelling in a group, then you can just book the whole room for your group. And if you’re travelling solo, then it’s a great opportunity to meet people, socialize, and make the most of your trip. The hostels usually have a kitchen, a lounge area, a bar, and a beautiful roof top. Quite honestly, they tend to be the coolest places in town. Abraham Hostel – dorms, private rooms, family rooms, kitchen, laundry, bar, lounge, rooftop tours, activities. Great location. Jerusalem Hostel – dorms, private rooms w/ balcony, rooftop, kitchen, dining area, computer stations. City Center. Little House in Bakah. 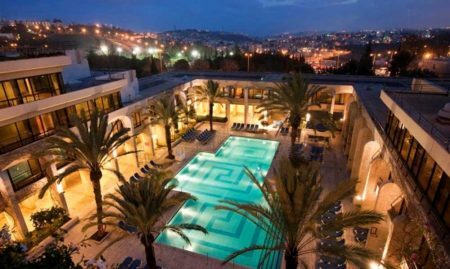 If you’re looking to treat yourself a little bit while you’re here, check out this intimate hotel. The prices are affordable, the location is beautiful, and the facilities are absolutely amazing. 2. Get local – go to the market! One of the best ways to save money on trips is cooking your own food. Unless your accommodations are all-inclusive, there is no reason why you should be eating out 3 times a day if you’re travelling on a budget. Go to the market or the supermarket – just like the locals do! One of the great things about Israel is that healthy food is not very expensive. You can literally buy kilos of vegetables that will last you 3-4 days for the price of eating one meal in a cafe. Nuts, milk, cheese, poultry and bread are all cheap and affordable as well. Meat is a bit pricy, though. Another thing that you should take into account is water. It’s pretty sunny all the time, so you want to drink as much as you can. But you do not want to buy a small bottle of water for $3 at a small convenience store or a kiosk (newsstand) every 4 hours. Instead, go to the supermarket or Mahane Yehuda Market and get a 6 pack of bottled water (1.5 – 2 liters) for $3.50! Also, visiting Mahane Yehuda Market is an attraction in itself, so you kill two birds with one stone. Now, while cooking your own food is important and will save you lots of money, you still have to eat out and try the great Middle Eastern and Israeli food that Jerusalem has to offer. Lucky for all the budget travelers out there, real local food is delicious and relatively cheap. So what should you be definitely eating? Falafel in a pita ($4-$6), Shawarma ($9-$11), Hummus ($7-$10), Sabich ($5), and Shakshuka ($12-$15). You should also try the regional sweets: baklava, knafeh, halva, kataif, malabi pudding, and sachlab. Another super cool thing that Israel can be proud of is its bakeries. Jerusalem is no exception. You will see lots of bakeries making bread and pastries on the spot and you can just grab a paper bag or box and fill it with all the salty and sweet goodies the world has to offer. The salty pastries are called burekasim (from the Turkish word bureka). It’s a small pastry filled with mushrooms, potatoes, cheese, spinach and so on. The sweet ones have different fillings as well. You’ll find tiny butter/chocolate croissants, pastries with cheese, apples, cinnamon and more. Four-or five of these pastries are great with your morning coffee and are only around $4 – $5. It’s fresh, it’s local, and it’s completely affordable. Bon appetite! If you want to learn how to make your own Middle-Eastern food, check out this fun Hummus making workshop. If you’re looking for good and local sit-down restaurants, we recommend checking the Burger Market, Hamarakia, and Tommy’s. Or in other words, get more beer for your buck. Drinking and partying in Jerusalem usually starts late, around 10-11 pm. So the bars and pubs offer happy hour deals for people who come earlier, usually sometime in the late afternoon, around 5-8 pm. Some pubs offer 2 beers/cocktails for the price of 1; some offer reduced prices during these hours; sometimes it’s combined with food. The bottom line is that you get more for less – so use it! Plus, you’re allowed to start drinking early, you’re on vacation! If you’re a beer enthusiast, one of the coolest places to check out is the BeerBazaar – it’s a colorful bar that serves interesting Israeli microbrews. It’s located in Mahane Yehuda Market. Another neat attraction is the Pub Crawl, led by the Abraham Hostel, that combines a guided tour of Jerusalem’s nightlife with shots, VIP entrances, specials drink, and more for a fairly cheap price. So if you like drinking, make sure to check that out. More pubs and bars to check out: Biratenu, HaTaklit, Beerman, Gatsby, HaHavit. Jerusalem is first and foremost all about history so you should definitely visit some archeological and historic sites. Let’s start with the Old City. 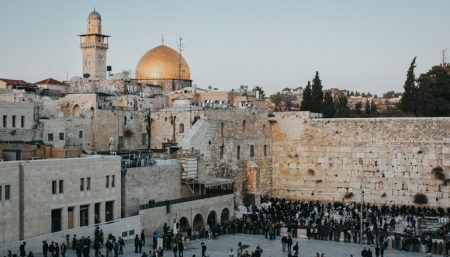 Instead of just walking around looking for museums, ancient synagogues, and attractions to visit, we would suggest taking advantage of the Jewish Quarter 4 Sites Offer. You basically get entrance to 4 Jewish Quarter historic sites for the price of 1 ticket. 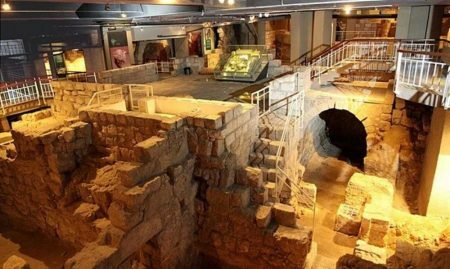 The great thing about it is that they actually offer THE sites you want to visit: Hurva Synagogue, Roman Cardo, Herodian Quarter, and the Jerusalem Archeological Park. Now if you’re looking to explore some modern history, you should visit one of Jerusalem’s most popular and important museums, the Yad Vashem – the world’s holocaust remembrance center. Admission is free and it’s a must-see not only for those in Jerusalem, but for people all around the world! There is always something happening in Jerusalem, and more often than not the really cool and trendy things are actually affordable and sometimes absolutely free. From music, poetry, and light festivals, to fitness classes at The First Station and alternative reality exhibits on the street. Once you know the dates of your trip, check out the free events happening during your visit. Note that some events have both free and non-free activities, so make sure you check the event highlights. O.k. now this is something that not a lot of tourists do. If you’re travelling on a budget, you should be exploring the nature that surrounds Jerusalem. Why? Because it’s lovely (and free)! The area of the Judean Mountains is perfect for hiking. There‘s loads of fresh air and so many beautiful landscapes, springs, magical trails, and historic and biblical sites. Seriously, every piece of land you’re walking on is a piece of history. This is the Holy Land – explore it! So where should you go? The Jerusalem Forest and the Gazelle Valley Park are good places to start. If you’re more into big urban parks, Sacher Park is one of the best places to visit with 40 acres of lawns, walking paths, picnic areas, and playgrounds. Visiting the Old City is absolutely mandatory. So is shopping for souvenirs, clothes, bags, jewelry, and what not. However, the Old City can be tricky, especially when you’re a tourist. Remember: you must haggle, but you have to know how to do it properly. The number one rule in haggling: treat vendors kindly. If you hear a price that is clearly too high for the product, try to avoid telling the vendors that they are liars and the item is overpriced. Instead, do this. Say you’re holding a beautiful set of porcelain plates, and you ask “how much is it?”. They tell you it’s 200 NIS. Look at it, say “no, it’s expensive” and then say “100 NIS”. Yes, you have to start that low so you can meet each other halfway. Keep on pushing the “it’s really beautiful but expensive” line until you get your price. If you see that the vendor is not haggling with you, put the item back and just start walking away. Two things might happen: the merchant might chase you and start reducing the price – that’s great. Or they might just let you go. And that’s also o.k. because you’ll probably see the same products 2-3 stores down the road. Another thing you should be cautious about is the currency – 15 NIS can magically turn into $15 just because you’re a tourist. 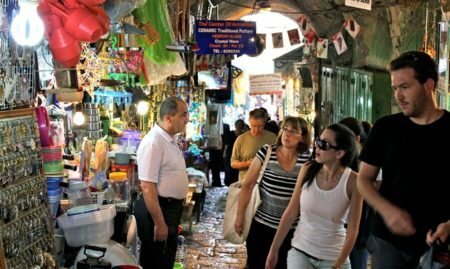 Also, don’t limit your shopping expedition to Jaffa Gate and the Western Wall area – this area tends to be extremely touristy and, therefore, expensive. Go to Damascus Gate and Zalah a Din Street and enjoy local prices. Don’t forget to eat there too! Jerusalem is a very walkable city, especially the parts most frequented by tourists. The City Center, the Old City, the beautiful and historic neighborhoods that were built outside the Old City walls, such as Nachlaot and Mishkanot Sha’ananim, are all within walking distance of each other. The weather is usually nice and suitable for taking long walks and exploring the city or even just getting from one place to another. This way you’re saving on transportation while seeing more of Jerusalem. Note that Jerusalem is a hilly city and therefore you want to have comfortable shoes – no flip flops and definitely no high heels! Anyone who is visiting Jerusalem on a limited budget should get the new Jerusalem City Pass. There are 2 types of cards: one that covers public transit, museums and tourist attractions for $63 and one that does not cover public transit but covers admission to museums and tourist attractions for $36. So what’s in the card? A round trip bus ticket to/from Ben Gurion Airport-Jerusalem, a 7-day pass to all public transit (busses, light rail), free entry to 3 of Jerusalem’s top tourist attractions and a free visitor’s guide and city map. Sounds pretty good, doesn’t it? Considering that a light rail/bus ride is a bit more than $1.5 and museum tickets range between $10-$25, we would say it’s a pretty good deal. Another great advantage is that the pass helps you plan and organize your trip, and that’s super important when you’re trying to see more and pay less. Get the JLM pass here! So here they are – our 10 most important tips and tricks to help you plan your vacation in Jerusalem and enjoy this beautiful city without a care in the world!